One of the reasons why the Footloose Forester uses a masthead with a heading that includes the key words: Essays, Stories, Adventures, Dreams is because his self-awareness tells him that in his desire to put into print some of the things that swirl around in his brain and that he would like to share with others, most ideas do--in fact, fall into categories that might best be described as essays, stories, adventures, or dreams. His chronicles are not planned; thus, any subsequent story might be about a real adventure, an especially vivid dream, an interesting but happenstance story about people, places, or things, or an essay that has been festering like a carbuncle that is about to burst. He doesn’t know what will come next, such is the nature of writing in the stream of consciousness mode. And it doesn’t matter. Getting something off his chest, or out of his system, is cathartic in itself. But it does not mean that the subject matter will be disposed of like a plastic bag full of donated personal clothing. Ideas that are personal and fondly regarded like personal items of clothing can be contributed; to persons perhaps unknown and who may never acknowledge what the ideas mean to them. The gesture is, nevertheless; an act of sharing. The memories of adventures will always be there and the convictions that go into essays do not go away. One thing about essays is the comforting knowledge that although others may disagree with the message in the essays, they know that essays are the work of individuals with opinions about things. Hence, the Footloose Forester feels unburdened in writing essays, from time to time, even about political topics that may or may not have supporters. And it doesn’t matter if no one thinks the same thoughts or agrees with the context of the essays. The essays of the Footloose Forester are created in response to conscious and subconscious impulses to lock away his own beliefs and opinions into archives that, in turn, should be open to scrutiny, to challenge, and to his own review at future moments of examination of conscience. In other words, he should not be afraid to check on the durability of his own opinions, when viewed in retrospect or in an open forum. The uncomfortable segue into the subject matter of this chronicle is all about that carbuncle of indignation that signals that an essay may be on the way. If and when it is shared with others is secondary in the psyche of the Footloose Forester; his first impulse is to express his thoughts in writing, the mode most amenable to contemplation, review, correction, and update. This controversial chronicle is about the Kompromat of the President of the United States. As they sometimes say in syndicated newspapers regarding contributed editorials: the views expressed are not necessarily those of the publisher and its staff but is the sole viewpoint of the author. So, here it comes—the viewpoint of the Footloose Forester. Our elected American president has been compromised by the Russian government for many years. He was surveilled by Russian intelligence services many years ago as the type of high-profile individual who would be a good candidate for being compromised, precisely because he has many of the characteristics that can be compromised. He was vain, narcissistic, well-known, in need of being propped up financially, and he had the ear of many American politicians. 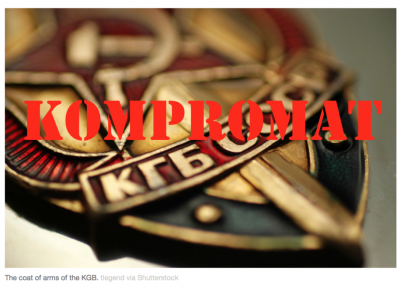 The Kompromat on our so-called Commander-in-Chief was assembled decades ago, in Russia. Our Narcissist-in-Chief made it easy by visiting Russia several times before he was elected and by developing personal ties with a few people who we now know were agents of the Russian government or powerful oligarchs who themselves had the ears of key members in the Kremlin. The Donald being comprised by others continues apace and the dossier of Kompromat continues to grow. The eventual history of the rise and fall of the compromised Useful Idiot in the White House will elaborate the nature and utility of the Kompromat that led him to accept (probably) laundered money to fund the building of his casinos, golf courses, and hotels. More recently, he sought to obtain financing from VTB Bank, a Russian state bank that has been sanctioned in the United States for past episodes of money laundering. They were willing to put up about a billion dollars (it has been reported) to build his cherished trump Tower in Moscow. As regards his personal business dealings as they intersected with political campaign ethics, he hid or forgot to mention to the voting public that such shady business dealing violates the Foreign Corrupt Practices Act, or that his involvement as a signatory to the Moscow Project agreement was part of his collusion with the Russians. For the record, The Foreign Corrupt Practices Act of 1977, as amended, 15 U.S.C. §§ 78dd-1, et seq. ("FCPA"), was enacted for the purpose of making it unlawful for certain classes of persons and entities to make payments to foreign government officials to assist in obtaining or retaining business. Conspiracy to collude with corrupt intent is still collusion and it is still conspiracy. More to the point, an offer to gift Vladimir Putin with a $50 million-dollar penthouse as part of the Moscow hotel deal can also be seen as a bribe and one more aspect of his complex quid pro quo with Putin. By the way, few of the anti-trump resistors refer to his dealings with the Russians as quid pro quo, in whole or in part. At this stage, it is still speculation on the part of the Footloose Forester, but he is unabashedly willing to speculate in these personal chronicles what the grand quid pro quo might contain. Making known the dirty money transactions from the past is one aspect that con artist trump wants to keep from the public. There are after all, bank records that can be summoned. His sexual escapades may also have been recorded by those who specialize in assembling Kompromat dossiers. His secret meetings with Putin after the election of 2016 probably contain tainted deals that he would not like others to know about. Again, for the record, his hour-long tête-a-tête with Putin at the G20 meeting in Hamburg, Germany in 2017 was in private (only a Russian interpreter present) and there was no press release about what they discussed. His private meeting with Putin in Helsinki the following year was also kept from public disclosure. Perhaps those gestures were testing the quid pro quo. But what did the Russians want in return? The whole world knows that the Russian State had been sanctioned by President Obama after Russia invaded the Ukraine and annexed Crimea. The Obama Administration ordered dozens of diplomats expelled and two Russian owned properties closed. The Russians wanted those properties back. They are part of the quid pro quo. Former National Security Advisor Michael T. Flynn was fired by the White House because he was caught lying about lifting sanctions on Russia. What sanctions? A UN-mandated sanction against Russia being permitted to sell oil on the open market, as punishment for their invasion of Ukraine. In essence, Flynn told the Russians before the presidential election not to retaliate against the United States because if Don the Con were elected, he would work to have the sanctions lifted. It was one item in the grand quid pro quo. The general public now knows that the newly elected president did try to have the sanctions lifted shortly after he was elected. The US Congress blocked those attempts; instead, they imposed more sanctions on Russia. Another item in the list of negotiables in the grand quid pro quo was an attempt by Russia to seek repeal of The Magnitsky Act, formally known as the Russia and Moldova Jackson–Vanik Repeal and Sergei Magnitsky Rule of Law Accountability Act of 2012, a bipartisan bill passed by the U.S. Congress and signed into law by President Barack Obama in December 2012, intending to punish Russian officials responsible for the death of Russian tax accountant Sergei Magnitsky in a Moscow prison in 2009. That was the main agenda at the infamous trump Tower meeting with Russian officials and members of the president’s campaign staff. That set of sanctions was directed at several Russian oligarchs who had financial interests in the United States and some of whom owned real estate in trump Towers in New York City. Our duplicitous president at first tried the hide details about the meeting and later concocted a phony cover story. The oligarchs wanted free access to their financial resources which included five known purchases of apartments in trump Towers, overpriced and probably paid for with laundered money. Real estate, by the way, is one of the major sinkholes of laundered money. On the opposite side of the quid pro quo, the Russians were offering dirt on Hillary Clinton, the political opponent of Crooked Donald. The collusion was later reported to be an insignificant meeting with no meaningful follow-up. Does anybody believe that? The Russian hacking of the 2016 elections and the elevation of Crooked Donald to the presidency is now a dark period in American history. But the whole story of the grand quid pro quo and the Kompromat that fueled it, has yet to be told.